While running errands this morning a thought came to me: a natural history exhibit in a museum is a lot like a stage performance*. When watching a play, the viewer knows she is seeing a performance, but it willing to suspend disbelief so long as the fantasy is well-created. To varying degrees, most modern natural history exhibits engage in the same theatrical relationship with their audiences. Exhibits re-create reality within the museum environment, and visitors accept the performance as truth. *Actually, I thought “movie” first, but theater is a better analogy because the actors are real and present. 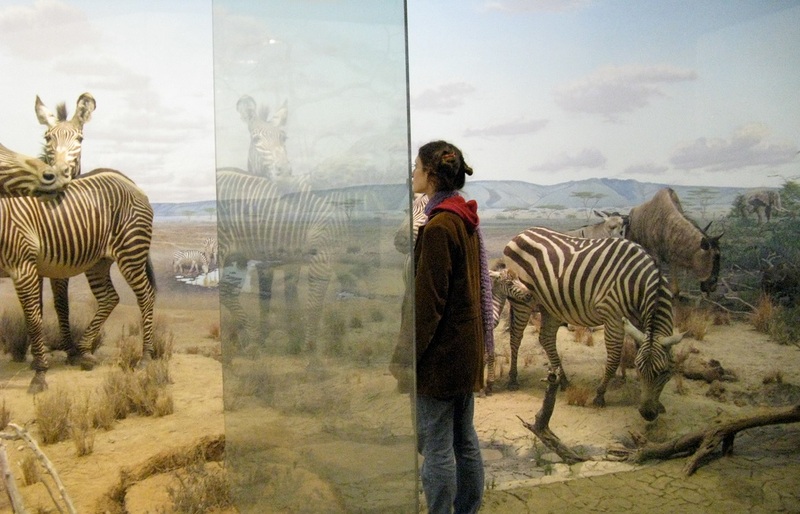 A rather poignant picture of the CMNH zebra diorama. Source: amyboemig on flickr. Habitat dioramas featuring taxidermied animals are the most obvious example. Dioramas like the lovely east African savannah scene at the Carnegie Museum of Natural History pictured above are exactingly detailed microcosms modeled after actual environments. The backdrops are typically based on photographs of real locations. The teams that collected the animal skins would also take samples of leaves and even molds of tree bark, in order to exhibit the ecosystem in toto. And of course, the mannequins on which the animal skins are mounted were sculpted by artists with a strong foundation in anatomical science. And yet, the diorama is clearly not real. Visitors know that they are not looking at an actual game reserve that has been somehow frozen in time. Many viewers might mistake the animals as being “stuffed” (they are in fact sculptures with tanned skins fitted onto them), but they still recognize some element of artifice. The animals clearly didn’t end up in the glass-enclosed box on their own accord. And yet, visitors accept the illusion, because they keep coming to museums to learn about the world around us. The same holds true for most other displays. These dioramas at the New York State Museum are not literally historic Iroquois villages shrunk down to 1/20 scale. The Tyrannosaurus and Triceratops pictured below are not really fighting, nor did they die in a death struggle. Even the Apple Store-eque NMNH Hall of Mammals recreates natural behaviors against a sterile backdrop. Unless the museum is displaying completely decontextualized specimens lying prone on a shelf, there is some degree of theatricality in the exhibit. Tyrannosaurus and Triceratops at the Children’s Museum of Indianapolis. Source. The theater analogy begins to go astray, however, when we consider that the performances in natural history exhibits are informed by reality. For the most part, exhibit designers do not place specimens in completely fictitious scenarios; the theatrical element serves to illustrate something real. Perhaps exhibits are more akin to a movie “based on a true story.” But like those movies, there is an undeniable selectivity in how museum workers tell their stories. Why are the zebra in the CMNH diorama chilling amicably with wildebeest? That is certainly something that real zebra have been known to do, but zebra have also been known to drown lions, trample foals and chew on the cars of obnoxious tourists. For that matter, why does this diorama not include any sign of human pastoralists, who have lived in the same environment as these animals for thousands of years? Exhibits have human authorship, just like any other document. The manner in which any specimen or object is displayed is inherently subjective, and there will always be emphasis and omissions, intentional or otherwise, that change the way the exhibit is interpreted. Before you misjudge me, dear reader, this is not an argument that there is no objective reality. I wouldn’t even say that it is impossible to understand and perceive objective reality. Scientists do it all the time. But when it comes time to communicate that information, we are creating something new, and choosing what we incorporate and how we express it. Getting back to my original point, we’re putting on a representational show. And that means that what we’re creating only works as long as our audience is willing to participate in the performance. If fossils are part of our planet’s heritage, and belong to all of us, are museum restrictions on photos ethical? Farke clarified that he was referring specifically to fossils held in collections, especially those collected on federal land and/or with public funding. Following the same sound logic that makes open access scientific publication a necessity, any scientific work using public resources should be accessible to everyone, including objects in collections. * The question had arisen because some museums bar researchers utilizing collections from using photographs in their published articles (or charge a fee for the privilege). This is a valid concern, but I don’t have enough experience with scientific publishing to explore it properly. Instead, I’d like to hijack the question in order to discuss the murky identity of fossil mounts. *I’m going to disregard for-profit museums for the time being, suffice it to say such collections exist and can be useful for research as well. A sampling of fossil collections and curators at the National Museum of Natural History. Source: http://paleobiology.si.edu. As was already pointed out in response to Farke’s initial question, the public’s right to access photographs of some fossil collections should not necessarily extend to museum exhibits. Any modern museum exhibit worth its salt is far more than specimens on shelves. 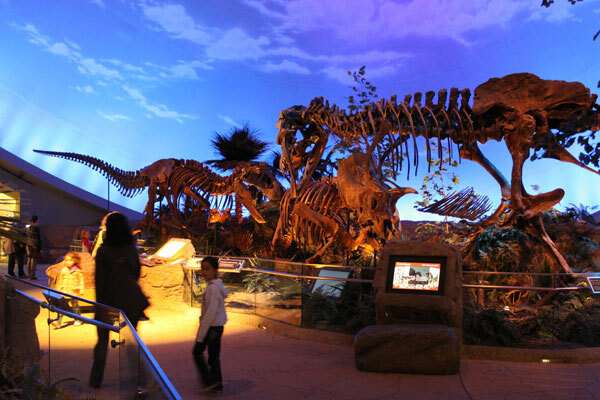 Exhibits are immersive experiences that use specimens to illustrate a story. A great deal of creative work goes into designing and fabricating an exhibit, and it is not unreasonable for museums to claim ownership of any reproductions, including photographs, if they so choose. Allosaurus and Barosaurus mounts in the Roosevelt rotunda of the American Museum of Natural History. Source: http://www.ourtravelpics.com. Fossil mounts, however, are a different beast. These structures are difficult to categorize because they are intended both to educate and to entertain. They may incorporate real fossils, or casts taken directly from them, but I would argue that fossil mounts are primarily constructed pieces. With the exception of some more recently extinct mammal taxa, most mounts are composites of casts, sculpted elements and original fossils collected in different places at different times. Steel armatures are custom-made not only to support the specimens but to appropriately fill the exhibit space. Mounts like the striking Barosaurus and Allosaurus encounter in the Roosevelt rotunda at AMNH (above) are designed to make an aesthetic impression as well as to inform. Overall, mounts require a substantial investment of time, labor, money and artistic skill to create and maintain. Experienced researchers typically guide the construction process and the contributions of knowledgeable scientists cannot be overstated, but fossil specimens certainly do not come out of the ground mount-ready. There is a great deal more to making a good mount than stringing vertebrae together in the right order. Robert Rockwell sculpts the internal model for AMNH’s taxidermied brown bear. Source: Scientific American. To make a non-committal final point, I’d like to mention that it is tempting to be too uptight about copyright, particularly in a museum setting. This past October, I had the pleasure to give a presentation with Alexis Fekete at the Kansas Museum Association’s annual conference. The most interesting part of our session (which was about how web 2.0 tools can help museums) was when audience members, mostly representing small history museums, voiced concerns over making their photography collections available online. There was apprehension about making it too easy for people to copy and sell pictures without permission, which I assume is the primary reasoning behind other museums’ policies prohibiting the publication of fossil images. I’m skeptical, however, that this is the most pressing concern. Perhaps I’m being naïve, but I have no problem with getting information disseminated to genuinely interested people. Creating awareness and enthusiasm for content is part of the general mission of museums, and I’d hate to see overzealous copyright barriers get in the way of that. Poliquin, R. 2012. The Breathless Zoo: Taxidermy and the Cultures of Longing. University Park, PA: Pennsylvania State University Press.